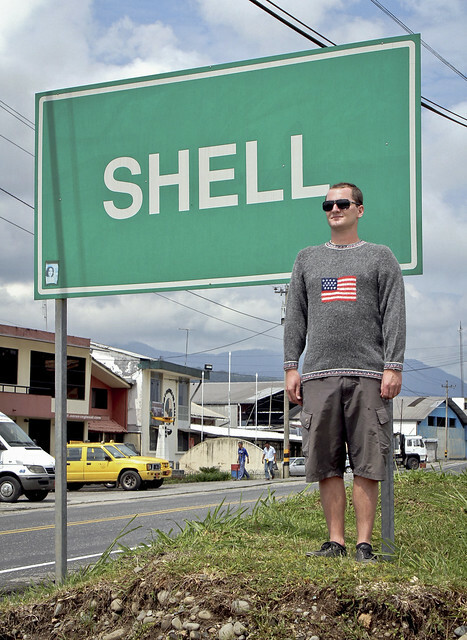 Shell is a small town located in Ecuadorian Andes named after Royal Dutch Shell Company. It was established in 1937 located near Indian tribes that strongly opposed the exploitation of resources found in their ancestral territories. On a few occasions the Indians attacked Shell, resulting in the deaths of several employees. I am wearing a sweater with american flag which I bought from old indigenous man few kilometres away from Shell. It is handmade of llama alpaca wool which is traditional material in this area handcrafted by indigenous people. Look up more information on exploitation of Ecuadorian Andes and rainforests!